WINNING TICKET. 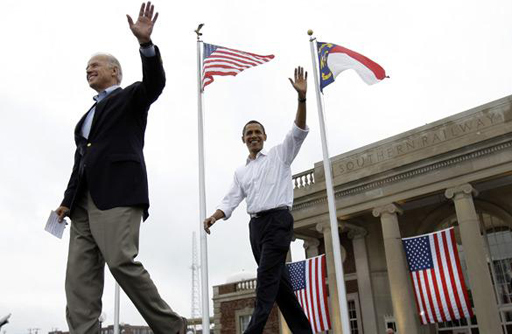 Democratic Sen. Joe Biden of Delaware (left), the next Vice President of the United States, walks with his ticket frontrunner Sen. Barack Obama of Illinois, the next President of the U.S., during a campaign rally in North Carolina on Saturday. Obama beats McCain by 20 pts. MANILA – The Filipinos for Obama Movement congratulates Democratic Sen. Barack Obama of Illinois for winning the first United States presidential debate by a landslide margin of 20 points against Republican Sen. John McCain of Arizona. With almost one million votes including those who believe it was a tie, respondents in an MSNBC survey believe that Obama got 56 percent as against McCain with 36 percent. About 53 percent of more than 900,000 survey respondents believe Obama won the debate as against 33 percent who believe that McCain did, while 6 percent believe it was a tie and about 7 percent are not sure. In a separate USA Today/Gallup poll, Obama leads by 12 points at 46 percent as against McCain at 34 percent. In a CBS News survey, uncommitted voters have seen Obama as the debate winner, with 66 percent saying the Illinois senator will make the right decisions when it comes to the current U.S. economy versus 42 percent for the Arizona senator. Meanwhile, a CNN poll reveals that 58 percent of respondents believe that Obama will better handle the American economy as compared to 37 percent for McCain, while 52 percent believe he will even better handle Iraq than 47 percent of those who believe that this is his rival’s supposed strength. Overall, 51 percent of those that CNN surveyed say Obama did a better job in the debate than 38 percent who think McCain did.